Vikram was once again carrying Betal on his shoulders while Betal narrated the story of the four foolish brothers. Once, there were four brothers, who were very foolish. People used to make fun of them, and so one day, they decided to become learned. They went in four different directions with a promise that they would meet at same place after ten years. Ten years later when they met, they discussed with each other what they had learnt. The first brother said, "I can make a skeleton out of a single bone of an animal." The second said, "I can cover a skeleton with flesh." The third said, "I can cover a flesh-covered skeleton with skin and hair." The fourth said, "I can put life into a dead animal." They decided to demonstrate their skills. They found a bone and first brother turned it into a skeleton, the second one covered it with flesh. The third one covered it with skin and hair. Now it looked like a dead lion. As soon as the lion came to life, it killed all the four brothers and ate them up. Betal paused and asked Vikram, "Who, according to you was responsible for the death of the four brothers?" 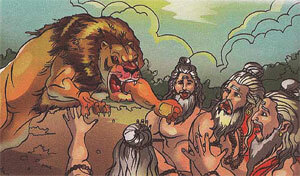 Vikram replied, "The fourth brother was responsible for their deaths because he was foolish enough to put life in a dead lion. Without life, the lion could not have hurt them." Betal said , "O king, you are right, but you opened your mouth again, so here I go." Saying so, Betal flew back to the tree.